2) Switch to low power (medium) and only use the COARSE knob. You may need to recenter your slide. Once it is focused..
3) Switch to high power (long objective). The view will be blurry, at this point only use the FINE knob. you may need to recenter the slide. There are several activities that I have used with the microscope unit, including an advanced laboratory exercise for my AP Students. Introduction to the Light Microscope – students focus the letter “e” on prepared slides and practice using common slides. Appropriate for first year biology or life science (grades 8-10). 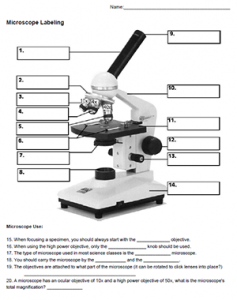 Investigation: How Can a Microscope be Used to Make Observations – this activity is designed for second year (AP) students, assuming they learned have already learned the basics. It includes review of how to focus and then more advanced topics, such as measuring with the microscope and creating wet mounts. How to use the Microscope – more of a guide that can be printed, I usually save this for students who miss a day or seem to be struggling.